In winter, when the snow lay glittering on the ground, a hare would often come leaping along, and jump right over the little Tree. Oh, that made him so angry! But two winters were past, and in the third the tree was so large that the hare was obliged to go round it. "To grow and grow, to get older and be tall," thought the Tree—"that, after all, is the most delightful thing in the world!" "We know! we know!" chirped the Sparrows. "We have peeped in at the windows in the town below! We know whither they are taken! The greatest splendour and the greatest magnificence one can imagine await them. We peeped through the windows, and saw them planted in the middle of the warm room, and ornamented with the most splendid things—with gilded apples, with gingerbread, with toys, and many hundred lights!" "I would fain know if I am destined for so glorious a career," cried the Tree, rejoicing. "That is still better than to cross the sea! What a longing do I suffer! Were Christmas but come! I am now tall, and my branches spread like the others that were carried off last year! Oh, were I but already on the cart. Were I in the warm room with all the splendour and magnificence! Yes; then something better, something still grander, will surely follow, or wherefore should they thus ornament me? Something better, something still grander, MUST follow—but what? Oh, how I long, how I suffer! I do not know myself what is the matter with me!" But the Tree did not rejoice at all; he grew and grew, and was green both winter and summer. People that saw him said, "What a fine tree!" and toward Christmas he was one of the first that was cut down. The axe struck deep into the very pith; the tree fell to the earth with a sigh: he felt a pang—it was like a swoon; he could not think of happiness, for he was sorrowful at being separated from his home, from the place where he had sprung up. He knew well that he should never see his dear old comrades, the little bushes and flowers around him, any more; perhaps not even the birds! The departure was not at all agreeable. The Tree only came to himself when he was unloaded in a courtyard with the other trees, and heard a man say, "That one is splendid! we don't want the others." 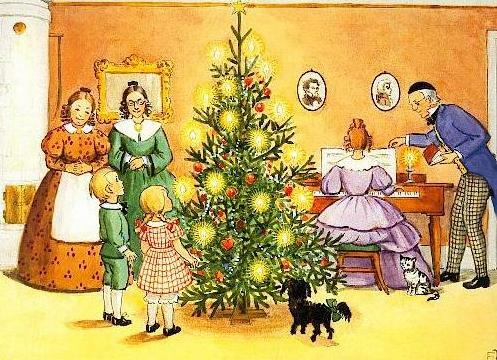 Then two servants came in rich livery and carried the Fir-tree into a large and splendid drawing-room. Portraits were hanging on the walls, and near the white porcelain stove stood two large Chinese vases with lions on the covers. There, too, were large easy chairs, silken sofas, large tables full of picture-books, and full of toys worth hundreds and hundreds of crowns—at least the children said so. And the Fir-tree was stuck upright in a cask that was filled with sand: but no one could see that it was a cask, for green cloth was hung all around it, and it stood on a large gayly coloured carpet. Oh, how the Tree quivered! What was to happen? The servants, as well as the young ladies, decorated it. On one branch there hung little nets cut out of coloured paper, and each net was filled with sugar-plums; and among the other boughs gilded apples and walnuts were suspended, looking as though they had grown there, and little blue and white tapers were placed among the leaves. Dolls that looked for all the world like men—the Tree had never beheld such before—were seen among the foliage, and at the very top a large star of gold tinsel was fixed. It was really splendid—beyond description splendid. "Ivedy-Avedy!" cried some; "Klumpy-Dumpy" cried the others. There was such a bawling and screaming—the Fir-tree alone was silent, and he thought to himself, "Am I not to bawl with the rest?—am I to do nothing whatever?" for he was one of the company, and had done what he had to do. "'Tis now winter out of doors!" thought the Tree. "The earth is hard and covered with snow; men cannot plant me now, and therefore I have been put up here under shelter till the springtime comes! How thoughtful that is! How kind man is, after all! If it only were not so dark here, and so terribly lonely! Not even a hare. And out in the woods it was so pleasant, when the snow was on the ground, and the hare leaped by; yes—even when he jumped over me; but I did not like it then. It is really terribly lonely here!" "What delightful stories you know!" said the Mice: and the next night they came with four other little Mice, who were to hear what the tree recounted; and the more he related, the more plainly he remembered all himself; and it appeared as if those times had really been happy times. "But they may still come—they may still come. Klumpy-Dumpy fell downstairs and yet he got a princess," and he thought at the moment of a nice little Birch-tree growing out in the woods; to the Fir, that would be a real charming princess. But when was that to be? Why, one morning there came a quantity of people and set to work in the loft. The trunks were moved, the Tree was pulled out and thrown—rather hard, it is true—down on the floor, but a man drew him toward the stairs, where the daylight shone. "'Tis over—'tis past!" said the poor Tree. "Had I but rejoiced when I had reason to do so! But now 'tis past, 'tis past!" The boys played about in the court, and the youngest wore the gold star on his breast which the Tree had had on the happiest evening of his life. However, that was over now—the Tree gone, the story at an end. All, all was over; every tale must end at last.